Event upgrade: Out with weird UI, in with touchstones! 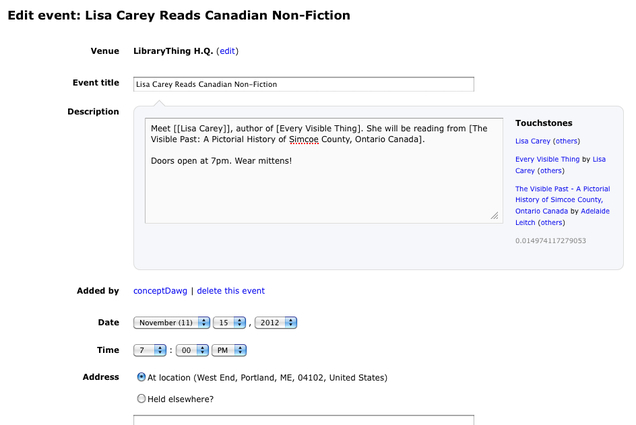 I've revisited how events are added to LibraryThing. The old system, involving picking authors, picking books and characterizing the event ("X reads from") is out. I've replaced it with a simple description box, but with the ability to add touchstones, just like on Talk. The goal is simplicity. The new interface requires less—some people will just paste descriptions in. But events are primarily about what's going on near you, not finding out where in the country so-and-so is speaking next month. If you use touchstones, however, it creates the links and puts the events on the author's LibraryThing page. If you want to test it out, you can—for now—add bogus events to the LibraryThing HQ in Portland ( http://www.librarything.com/venue/2427/LibraryThing-H-Q- ). But why not go to your local bookstore and add their events? I wish just about every place you could enter text in LT used the Talk engine. Or at least the touchstone part of it. The touchstone parsing code and selection UI need work, but at least it would get more ROI when you put in that work. Agreed. I'm going to be making the ordering better now. It's better elsewhere. I'm just not post-processing there. Next up, personal comments, I think. I really like this. I'm just copying the event description from the bookstores' sites, and adding the requisite brackets. So much easier! Exactly. Should I put "just copy it" in there? Oh, I need to make it limit the length with a "more" in display. Should I put "just copy it" in there? Maybe "Copy the venue's event description or write your own". I don't think you want to say anything to suggest that people are limited to the description on the venue's website. Indeed. They can bite me. It's nice that Local is final getting some improvements, though I think events are probably the least useful part. They're so transient. I was thinking just the other day that I'd like a way to catalogue bookstores I've visited, including ratings, reviews, tags, etc. We can leave comments, but those are mostly for other people's benefit because we don't have an easy way to review all the comments we've left. The arguments for doing this are the same as the arguments for why tags work on LT but not on Amazon: people enter more stuff when they're doing it for themselves. I'm also hoping to see a complete overhaul of the maps eventually. What I'd like to see on Local is a way to filter out a lot of the noise. Like the River Forest Library's kiddie events that have taken over my Local page (and they are miles away from me). Perfect timing Tim! I just added the launch party for my friend's debut novel! It was easy-peasy! This only works with new (post-touchstone) events. It picks the most popular (ie., copies) book mentioned by touchstone in the post. But events are primarily about what's going on near you, not finding out where in the country so-and-so is speaking next month. I've disliked this attitude since LibraryThing started automatically adding Waterstones events here in Britain, without linking them to the author's page. 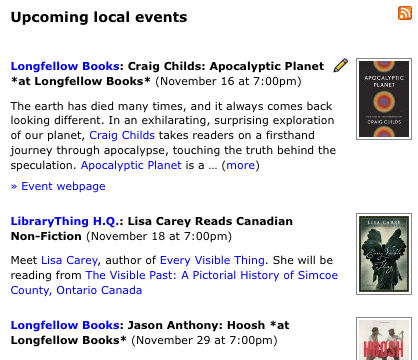 "finding out where in the country so-and-so is speaking next month" is exactly what I want from LibraryThing events. I live in a small town, rarely visited by authors, and I'm much more interested in finding out where my favourite authors will be, than knowing that yet again nothing is happening nearby. We don't add Waterstones events automatically, though. I hear your complaint, though. But events suffered from being too hard to enter. There's always going to be a push-pull between complexity of metadata and the incentive to add it in the first place. But I hear your point. Perhaps its time to revisit the idea of filters for events. I know you thought it was too complicated but perhaps you could just add a few checkboxes for the most common event types or attributes, like for-children, for-adults, book-signing, book-reading, etc. and let other LT members modify them in case the person who entered the event didn't check any boxes. And then let lilithcat filter out the children's events if she wants. No, it's got to be done in a way that doesn't make event-adding any easier. And then let lilithcat filter out the children's events if she wants. I do want to make clear that I don't have anything against children's events, per se. It's just that my local page is being inundated by such events from a library that is pretty distant from me, in part because they are recurring events. (They are currently more than 2/3 of the events on the page.) As result, other events get buried. Can we get some discussion and/or guidance on how to use touchstones in Local events? For instance, since the book image is based on touchstones, I would think we should only touchstone the actual book being read or discussed, not any other works "also by" the author that happen to be in the event description. This is partly because if the work being discussed isn't on LT yet, if there's some other work also touchstoned, the image will give the wrong impression of what book the event is about. Also, what are people's thoughts about using touchstones for authors when the event is a book discussion where the author isn't actually there? Events touchstoned to authors get listed on the author's page. That might not be so much of a problem if the author is, say, dead. We know Shakespeare isn't going to be at my local library. But Hilary Mantel... should we have every local book club's discussion of Wolf Hall showing up on her author page, or only events where she's actually present? Also, as I mentioned on another thread, shouldn't we make sure the touchstones are actually pointing to the right person and work, and not have events pointing to the wrong book or author? If the book or author isn't in LT, should we leave the touchstone out? Sometimes when the book isn't in LT, there's a similarly titled work that is, and the touchstone ends up pointing to it. Ditto for authors. shouldn't we make sure the touchstones are actually pointing to the right person and work, and not have events pointing to the wrong book or author? Of course we should! I can't imagine anyone thinking otherwise, though I can imagine people not taking the time to check. If the book or author isn't in LT, should we leave the touchstone out? Yes, because there's nothing to touchstone. When there is nothing to touchstone, I have been putting titles in italics, and sometimes making the author's name a link to her website. I ask all this because I've seen several recently added events where touchstones point to the wrong author or book. Unfortunately our helper history doesn't go back far enough to check very many of them, so there are probably lots in the system now. I agree on leaving the touchstone out where it doesn't point to anything. What do people think about whether we should touchstone other books mentioned in the event description, even if they're not the focus of the event? My view is that we shouldn't (because it effects the image). 26> What do people think about whether we should touchstone other books mentioned in the event description, even if they're not the focus of the event? My view is that we shouldn't (because it effects the image). I concur - it's common to find an event description like: John Smith, author of Great puddings of the world, will discuss his new book, Even more great puddings. Of course, the new work often doesn't have a cover on LT yet. Right, unless it's to be expected that the other book(s) will be discussed as well, obviously. But mere mention of "also wrote"... Nah. The question: For "book club" type entries, where a group is discussing a book but the the author won't actually be present, should we touchstone the author too or just to the book? Adding the touchstone for the author adds the event to the author's page, which may be misleading. The comment: It would be really helpful if the norm were to add a link to the event, whenever possible. Personally, I find a link to a website where I can find out more info, even without a description on LT, much more useful than just a description on LT without a link. I know the push now is to get as many events as possible into LT, to raise money, etc., but the overarching goal should be to make event listings as useful and as accurate as possible -- so that not just does LT have a lot of event listings, but so that people actually use them actively. Event URLs are, imho, vital here, when they're available. I would touchstone the author as well as the book for book club entries. I don't see any reason why an author page shouldn't include events about the author, as well as with the author. It would be really helpful if the norm were to add a link to the event, whenever possible. Yes, I agree. I have found a number of venues which list the events on their home page, rather than having a separate page or pages, so in those cases I see no reason to add that link, but otherwise I try to do so. I don't see any reason why an author page shouldn't include events about the author, as well as with the author. Agreed. There's a clear plus, and it's not like people go to an event without reading it.